1994 The VI Premi International Catalonia D’IL.Lustracio, Palay Marc, Barcelona, Spain. 2004 ‘Illustrations’. The National Trust; Petworth House, West Sussex. Illustration work: Children’s Books publishing, Greeting Cards Designs, Packaging. Dorling Kindersley, Marks & Spencer. First book publication in 1984. Using gouache, watercolour, line or pencil, Caroline’s style is versatile, imaginative, with a touch of wit. Very fine detailed work is a speciality. Christina Casement is an artist and designer of ceramic tiles and china, also pen and ink drawings, illustration, woodcuts and wood engravings, individual designs for bookplates and has won prizes for many of these. She exhibits and sells at juried shows, and also undertakes commissions for work in several media. Accurate studies of birds, flowers and butterflies are a speciality as featured in Chris Blanchett’s 20th Century Decorative British Tiles Vol 3, pp 52-55. Christina is now mainly enjoying exploring egg tempera painting, also silverpoint drawing. She also teaches the technique of painting with ceramic paints on tiles and china, and firing the work in a kiln, in regular classes at her own home. George Mason University, Fairfax, Va, U.S.A.
View Francis Hurst Eastwood's Artworks here. Francis (Frank) Eastwood was born in Huddersfield on 13 March 1855. In 1874 he won a scholarship to study at The Royal Academy Schools in London and then began to work as a professional painter. Travelling widely, he exhibited and took portrait commissions, showing his first picture - Porto San Giorgio - at the Royal Academy in 1878. At the time, he was lodging with Dr John Harvey James of Thurloe Square, a well known physician and surgeon, where he met and, in 1883, married the doctor's fourth daughter, Frances Annie James. They travelled to Tangiers for their honeymoon, the location of several of his paintings and on their return they set up house in a studio flat in Kensington Square Mansions. In 1888 the Eastwood’s only daughter, Nina, was born. It must have seemed a wonderful bonus, in a period when the Pre-Raphaelites were popular, that she should have had Titian copper-coloured hair; Frank painted her constantly in her childhood. Frank and Annie travelled extensively in France and Italy to paint. In 1890 they went to Paris for six months where Frank studied a different style of painting. This was the time of the Impressionists and their influence can be seen in his use of colour and his transition from the academic to a more free approach. He continued to exhibit his paintings at The Royal Academy up to 1902; some were ‘hung on the line’, an honour which helped establish his reputation and income. At the turn of the century the family rented a house at Compton, near Guildford, for several summers and decided they would move out of London permanently. Frank went out on his bicycle one day and came back to say he had bought Anstead Brook House. Having added on a large studio, F. H. Eastwood turned his skills to painting rural subjects, travelling about by pony and trap. When visiting London he would drive his trap to Milford Station leaving the pony, complete with trap, to find its own way home! 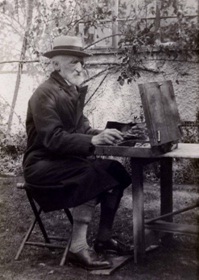 He was an enthusiastic member of the Haslemere Society of Artists and exhibited many paintings locally from 1921 to 1928. In 1926 the Eastwoods moved to their newly built house, Woodsome in Fernhurst designed by local architect Harold Annesley Brownrigg. Many of Frank’s paintings were very large and the floor had to be lowered during the building process to accommodate two in the drawing room. The move to Fernhurst was precipitated by the marriage of his daughter Nina to Walter Duke, son of Fernhurst’s doctor. In 1928 the Eastwood’s only granddaughter, Maureen, was born. She has taken great pride both in Frank’s works and in providing these biographical details, hitherto unpublished. Frank and Annie Eastwood are buried in Fernhurst, West Sussex. LISTED: Biographical Dictionary; RSBA; New English Art Club; Dictionary of Victorian Painters; Dictionary of British Artists 1880 - 1940; Graves Dictionary; E. Benezit. EXHIBITED: Royal Academy; Royal Society of British Artists; Royal Institute of Painters in Watercolours; The Dudley Gallery, Piccadilly; Manchester City Art Gallery; Walker Art Gallery, Liverpool; Haslemere Society of Artists; The Midhurst Gallery. View Adrian Hill's Artworks here. Adrian Hill studied at St. John's Wood School of Art, 1912-14, then at the Royal College of Art, 1919-20.
including the Victoria & Albert Museum. observation post in one of the battered trees'. HQ showing repairing and the like. their early pictures chosen for Adrian Hill’s celebrated television programme. Adrian Hill lived in Midhurst and was the first president of the Midhurst Art Society. View Paul F. Masset's Artworks here. 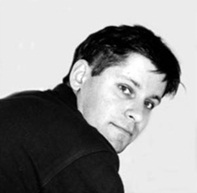 Paul Masset, was born in 1967 and brought up just outside Paris. At the age of eight his maternal grandfather, the late Gordon Gash of Midhurst, had introduced the young Paul to painting in oils but the defining influence of his art was derived from Peter Norton (1913-1995) who founded the Cubertou Art Centre in south west France. It was here that Paul, from the age of 16, was introduced to the medium of soft pastel inspired by Peter’s friendship with Paul Maze (1887-1979). Paul quickly showed a remarkable aptitude in acquiring Maze’s freedom and vitality of execution through this medium. Like Paul Maze (who lived at Treyford), Paul Masset is a bi-lingual Frenchman with a foot on both sides of the channel. The Normandy School of impressionism (Monet; Manet; Sisely; Maze), the capturing of atmosphere through light and colour (Braque; Matisse; Derain) and their revelation through the medium of pastel (Degas; Vuillard; Delacroix) are the influences Paul Masset brings together in his love of nature, land and sea. In recent years, Paul has increasingly painted in oils and demonstrates his personal and unique sensibility in his pastel drawings and paintings of Normandy, Brittany, the South of France and West Sussex. Paul Masset has exhibited in London, Paris, Versailles, St Germain-en-Laye, Strasbourg and Chichester and many times at The Midhurst Gallery. He and his family live near Rouen. View John Robinson's Artworks here. John Robinson was born into a painting family and his grandfather and brother were/are both professional graphic and fine artists. John graduated in Agronomy which ultimately led to a busy career in business management which took him to any places overseas. In those days there was little time for painting but it has always been a compelling interest. Largely self-taught, John specialises in watercolours as he enjoys exploiting the spontaneity and freshness of the medium, suggesting detail rather than labouring it, but retaining a mainly literal interpretation. John derives particular inspiration from the form and mood of the Downs. He finds the colours and feel of autumn, winter and spring every bit as exciting as high summer. His working method is basically reliant on sketches done on site, perhaps supported by a photo, which means he lingers on the scene long enough to absorb its distinctive atmosphere. These sketches occasionally can be good enough to exhibit as they are, but more normally form the basis of finished paintings produced in the studio. While the Sussex and Hampshire countryside are a special interest, John’s subject matter is wide ranging, including many other types of landscape, but also townscapes, boats and seascapes, still life and living creatures. John exhibits widely; his studio opens each May as part of the Chichester Open Studios Trail, and he participates in many art society and art group exhibitions. He enjoys the camaraderie of painting and exhibiting with others.